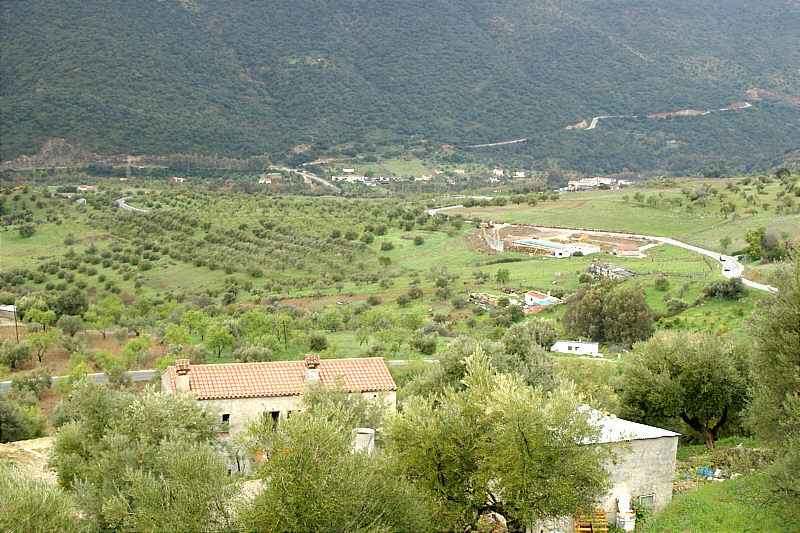 Photo: View of the valley at Jimera de Libar. Eastern Mojave Vegetation View of the valley at Jimera de Libar. From the base of the town we walked up the highway, away from town, to a small path that then led to the access road to the finca. The road stayed on the contour of the hill as we walked a short way to the ranch. The lot is about 9000 m2. When Chris and Sue bought this was about the minimal size parcel to build a house. Since then the area has been up-zoned to a minimum lot size of 25,000 m2. From the top of Chris and Sue's lot we were treated to this excellent view of the valley of the Rio Guadiaro. Field Notes: Sunday, February 22, 2004. Other photos about Spain - Andalucia or Jimera de Libar.